Researchers at the UPV/EHU-University of the Basque Country in Spain have developed and characterized hybrid materials that respond differently to light, and which have potential for use in fields ranging from optics to biomedicine. Hybrid materials combine different components (organic and inorganic) to obtain novel properties produced by the synergistic effect between the components. Rebeca Sola, a researcher in the Department of Physical Chemistry at the UPV/EHU's Faculty of Science and Technology, has developed and exhaustively characterized various hybrid, photoactive materials that respond differently when exposed to excitation light. As reported in a paper in Chemistry - A European Journal, the hybrid materials were obtained by incorporating fluorescent dyes, which are routinely used in solution, into channeled inorganic structures. These materials provide the dyes with protection, thus rendering them more stable against degradation and increasing their useful service life, and also provide the system with rigidity, which is interesting as this has the potential to increase the photophysical properties of the organic hosts (the dyes). "Highly fluorescent materials in which the dyes are found to be ordered were obtained, thus providing a highly anisotropic response to the linearly polarized light," said Sola. In other words, the hybrid materials responded differently depending on the direction of polarization of the incident light. Furthermore, it "is fairly straightforward" to synthesize these materials. "Crystalline structures in which the dye has already been occluded inside are obtained without any need to apply a diffusion process to insert the dye into the crystal," she said. Sola has thus produced materials with a very wide range of optical properties. "Of great interest are those in which there is an artificial antenna effect with the ordering of the different kinds of dye and a unidirectional energy transfer," she said. This is produces particles with multi-colored fluorescence that can collect and transfer the energy from light, which could be of interest for use in solar cells. Another of the materials is a solid material that emits delayed fluorescence: instead of the fluorescence switching off as soon as the excitation source is removed, as is usually the case, it persists for tenths of a second and is perfectly visible to the naked eye. "This kind of technology could be of interest in LED technologies," Sola explained. Materials capable of transforming incident laser light into light with double the amount of energy were also obtained. In addition to being able to incorporate a single dye into the inorganic structure, various dyes can be incorporated simultaneously. 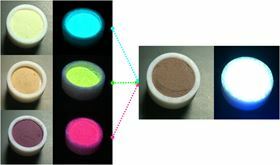 "With two dyes whose response is complementary, we have obtained fluorescent particles that change color depending on the light polarization, and change from a blue fluorescent emission to a green one," said Sola. "What is more, it is a reversible, reproducible process." By then incorporating a third, red-emission dye in the correct proportion, the researchers produced a white-light emitting system, which Sola said is "once again of interest for illumination systems". White-light emitters were also produced by adding small organic molecules to certain frameworks of metal ions and organic compounds known as metal-organic frameworks (MOFs). Ambient-temperature phosphorescence was also achieved with these materials. "Phosphorescence is an emission process that routinely calls for very low temperatures to prevent the phosphorescent light from deactivating," explained Sola. The researchers have shown that hybrid materials may have applications in other fields, such as biomedicine. For example, they used photosensitizing substances suitable for photodynamic therapy to produce hybrid materials that generate oxygen species capable of killing cells when excited by light. Photodynamic therapy is a procedure used in dermatology, for example, to treat a range of skin diseases and even certain types of cancer. These hybrid materials not only generated cytotoxic oxygen but were also fluorescent, which "makes them very useful for bioimaging as well", said Sola. "The phototoxic action of these compounds is being explored by means of experiments in in vitro cell cultures, and although the results are promising we are still in the early phases of the study." This story is adapted from material from the UPV/EHU-University of the Basque Country, with editorial changes made by Materials Today. The views expressed in this article do not necessarily represent those of Elsevier. Link to original source. (Left) Channelled aluminophosphate containing various encapsulated dyes emitting in the blue (acridine), green (pyronin Y) and red (LDS 722) regions of the spectrum when illuminated with ultraviolet light. (Right) Channelled aluminophosphates containing several dyes in the correct proportions producing white light when illuminated with ultraviolet light. Images: Rebeca Sola; UPV/EHU. Hybrid photoactive materials with more stable and more rigid dyes obtained.